Colors:50% cotton/50% polyester Oxford:52% cotton/48% polyester Dri-Power moisture wicking fabric. 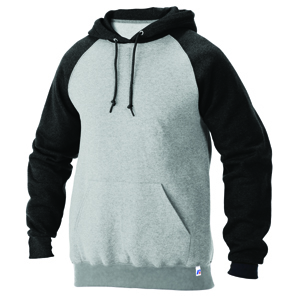 Three-piece double ply hood with knit drawcord. Oxford jersey back neck tape. Raglan sleeves with 2-needle coverstitch. 1x1 ribbed cuffs and waistband. Front muff pocket. "R" logo flag tag on wearer's left hem.